Chris Girard receiving the award from Diane Norris and judge Jason Johnson. Caroline Kirby participating in the state dairy show. Highgate--Like athletes in training, Vermont 4-H dairy club members have put in countless hours over many months to get their livestock in top condition for a major dairy event--the State 4-H Dairy Show, Aug. 13. The event, planned for the Franklin County Field Days grounds in Highgate, promises a lot of heart-pumping action for competitors and spectators alike as the youths parade their animals around the show ring and compete for championships. Admission is free, and the public is invited. Lunch and beverages will be available for purchase on site. Separate competitions at this University of Vermont (UVM) Extension-sponsored event will be held for Holsteins and colored breeds, with classes getting underway at 9 a.m. First up is the fitting and showing competition. In these classes, arranged according to the exhibitor's age, judges will evaluate the 4-H'ers on their poise and presentation and handling of their animal. In the conformation classes, arranged by breed and age of the animal, the focus is on the overall appearance, physical structure, condition and breed characteristics of the animal. 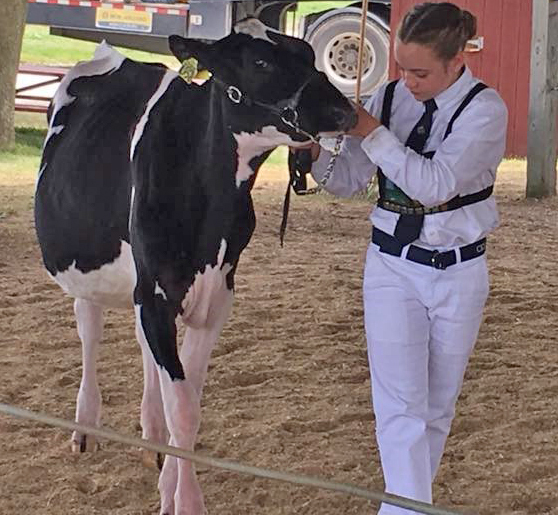 In addition to earning ribbons and championships, 30 of the show's best exhibitors will be selected to compete at the New England regional 4-H dairy show at Eastern States Exposition in West Springfield, Massachusetts, in September. To qualify for the state dairy show participants must be 11 to 18 years old and have participated in a local 4-H dairy show and community service activities this year. They also are required to submit their 4-H dairy project record books for evaluation and have an in-person interview to discuss their 4-H project work and answer questions to assess their overall dairy knowledge. The day prior to the show, the 4-H'ers will compete in a grilled cheese contest and a barbecue provided by the Franklin County 4-H Foundation. To learn more about the UVM Extension 4-H dairy program, contact Wendy Sorrell, UVM Extension 4-H livestock educator, at wendy.sorrell@uvm.edu.